Gary was born August 9, 1935 at Washburn, ND to Leland and Mabel [Erickson] Miller. As a child, his family moved frequently throughout the US as his father was in the military, He was one of four children including sister Gloria and brothers Deane and James. Miller showed an early interest in art, sketching animals at the age of 5. While he took art classes in school, he was largely self-taught. "Rocky Mountain peaks, piecing through the clouds were the backdrop for my childhood sketches," quoting from the former Idaho resident. But after World War II, the family returned to North Dakota. Gary completed high school in Bismarck and attended what is today Bismarck State College. He and his wife Darla [Kuhn] met as juniors while attending Bismarck High School. Gary and Darla were married on June 14, 1954. They moved to 1604 Linda Drive in Mandan, where he worked as an operator at the Amoco Oil (now Tesoro) refinery, eventually promoted to operations shift foreman. He began exhibiting his work in 1960. His talent & quality of work earned him numerous "People's Choice" awards at art shows & went on to exhibit his art across the US. He "retired" briefly from the refinery in 1974, but returned shortly over his concern on supporting his wife and children relying on his artwork alone. But in 1975, he retired permanently from the refinery and devoted himself to his art full time. Gary and Darla opened <?xml:namespace prefix = st1 ns = "urn:schemas-microsoft-com:office:smarttags" />Gary's Gallery in Bismarck, in 1975. They opened Gary�s Gallery II in Scottsdale, AZ in 1984. The Scottsdale gallery was closed in 1998. Throughout his career, he was recognized for the authenticity of his work, stemming from his thorough detail and research. To him, each old building, train, boat, gun, or antique car was history. Gary tried to tell its story. "When you look at my paintings I hope you see not just an old house, but the story of lives past." Gary Miller gained national prominence in the field of art. His paintings and illustrations of rural life have appeared in magazines, calendars, and galleries throughout the nation. He also received numerous honors and awards. Painting by Miller hang in private and permanent collections throughout the United States as well as the ND Governor's office. 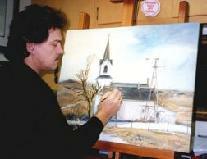 In 1989, Gary painted the ND Bicentennial Series of posters. 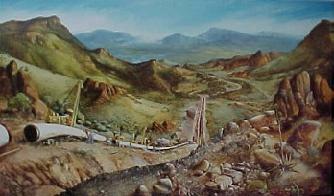 Gary was commissioned to create a series of three paintings for the Lewis and Clark bicentennial in 2003. 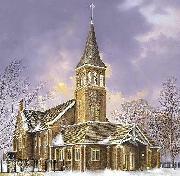 He finished the final painting in his church series (which includes St. Joseph's Catholic Church in Mandan) that same year. As the saying goes, "all work and no play" makes Gary a dull boy. After his family and art, Gary's next passion was hot rods and muscle cars. He would spend hours cleaning and hand polishing his series of vehicles. A true fan, he never became overly attached to any single car, but seemed to have to have a new one every couple of years. He was a life member of the Elks Club and served with the North Dakota National Guard. The Millers had five children including sons Dana, Keenan, Kent and Garret plus daughter Kara. 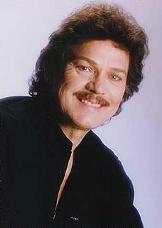 Gary Miller died on October 23, 2003 and is buried in St. Mary's Cemetery, Bismarck, ND. The Mandan Historical Society would like to thank Darla Miller for sharing her family photographs and biographical information on her husband with us.